There's no need to get fancy with part management in your CMMS. Pick some elements of your store room and your parts that you can keep simple, like your part ID's, names, categories, types, locations and so on, and go with it. Sometimes using a more basic system works. If you find yourself getting caught up in details having a long conversation about any of these elements, take a step back and try to make it simple again. Once you've decided on how you're going to enter your part information, don't deviate from that plan unless something turns out to be massively wrong. By maintaining consistency throughout your system, and especially in your parts room, you can ensure that any anomaly is caught quickly, sparing (excuse the pun) yourself from headaches later on when you are looking for a part to reorder, or even more critically, use on a piece of equipment that needs maintenance or repair. We've all heard them, Sort, Set, Shine, Standardize, Sustain; the principles of the 5S methodology. 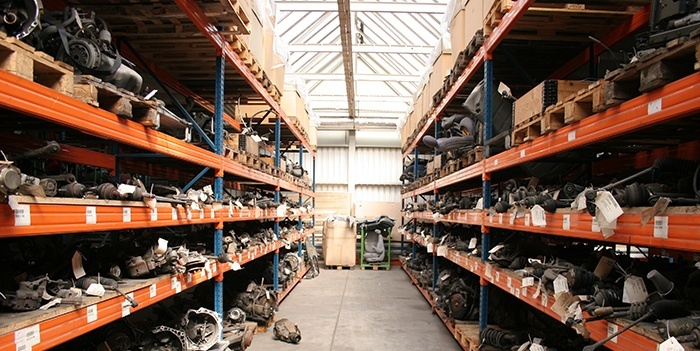 When it comes to organizing your spare parts inventory, keeping up with this process is vital. If you follow the principles of continuous improvement, and make it a daily priority to maintain your store room at a high level, there will be much less cleanup for you to handle in the future. If you're constantly rifling though your parts bins for parts or looking through shelves for bigger items like motors and belts, you may not have followed the first rule of finding anything: Know where it is in the first place! Proper location information is crucial to cutting down wasted work time looking for parts. When you're setting up your spare parts inventory in your CMMS, or doing an inventory recount to make sure your important items are accounted for, make sure that all your parts have a location, and make sure that location is reflected accurately in your system. With maintenance personnel constantly working to keep your operation running or your facility working, it's not always easy to present the value of taking the extra time to check out parts using your maintenance management software. However, most modern maintenance management software will offer apps with part checkout and return features, or at the very minimum a part checkout screen for web-based products, that makes it much easier and more efficient to checkout and return parts. Using these tools, and managing your part storeroom through other means, such as a storeroom supervisor, parts manager, cameras, or a crib system, is an excellent way to put money back into your budget. Pretty much any CMMS worth its salt is going to have an auto-purchasing system where you can enter maximum and minimum quantities of your parts that you want to be kept on-hand, and receive automated purchase requests to refill those quantities when you drop below your minimum quantity. This process takes a little time to set up, because you need to get all of your current quantities in the system, and determine what your max and min values are going to be, but it's incredibly valuable in the long run. With the Internet of Things making systems, and parts, more intelligent, your system will grow in the future to understand what parts it needs based on usage, facility condition, and maintenance schedule. This may be the most time consuming piece of the entire parts and inventory management process, but it's very important to the health and maintenance of your parts database, and your budget. No matter how hard you try to ensure people check out and return parts when the need to, or how well-managed your purchasing process is, there's inevitably going to be parts here and there that simply vanish, or reappear, or end up in the wrong place. Performing physical inventory counts helps mitigate the impact of these types of part mismanagement, and guarantees you at least have the opportunity to maintain correct part levels. To save on time, make sure your CMMS has a mobile app for performing your counts, there's no need for an endless spreadsheet and a thousand trips back and forth to your desk. Just take your mobile device out into your store rooms, bring up the correct part by location, and enter the physical count, then move on. This process used to takes weeks, now it can be done over the course of a day or two.